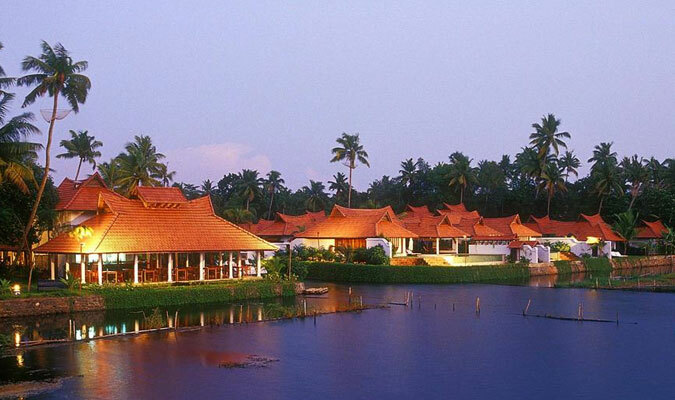 Placed amidst the serene location of Kumarakom, Kumarakom Lake Resort is one of the finest hotels here that is place on the banks of Vembanad Lake. Covering a lush land of 25 acres, the resort is 4-time winner the ‘World Travel Award’ as a leading resort. 59 rooms, suites and villas at the lake resort are huge, well-equipped and offer a comfortable stay to the guests. Enjoy world-class facilities including Wi-fi connectivity, business center, outdoor Jacuzzi, concierge service, indoor-outdoor activities and more. During your stay savor various Indian and popular World fares along with a vast variety of beverages. Presidential Suite: Ultimate luxury is the word for the Presidential Suite that offers a private courtyard and a private pool along with other contemporary comforts such as attached bathroom with attached bathtub and complimentary toiletries, a separate sitting area, LCD TV with satellite connection, attractive wooden interiors, wooden flooring, stylish bay windows, electronic safety deposit and more. Heritage Lake Villa With Private Pool: Taking its cue from traditional home décor of Kerala and boasting of attractive wooden interiors, Heritage lake villa with private pool offers a mesmerizing view of the Lake. Indulge in world-class facilities such as private bathroom with Jacuzzi, telephone with direct dialing service, private sit out space, tea-coffee maker, buffet breakfast, complete air-conditioning, a dressing table, complimentary breakfast buffet and so on. Heritage Villas With Private Pool: Heritage Villas with Private Pool at the resort offer a nice view of the lush garden of the property and comes with wooden décor. Outdoor Jacuzzi, personal swimming pool, LCD TV with satellite connection, round the clock room service, special sitting area, private bathroom with bathtub, housekeeping services, complimentary buffet breakfast, AC with room temperature control etc are some of the facilities and amenities offered here. Meandering Pool Villas: Meandering Pool Villas that are a duplex accommodation option come with a 240 m long swimming pool, a private sitting area, wooden décor, 1 master bedroom, a deluxe room on the top floor, 2 king-size beds and a lounge area. Admire lovely views either of the verdant garden or the pool area. You can enjoy facilities such as 3 LCD TVs with satellite connection, attached bathroom with complimentary toiletries and shower area, complimentary buffet breakfast, electric safety deposit and so on. Luxury Pavilion Rooms: Luxury Pavilion Rooms offer a pleasant stay amidst ultimate comforts and luxuries. These rooms consist of services and facilities such as attached bathroom with toiletries, bathtub and a Jacuzzi. Round the clock room service, complimentary breakfast buffet, separate sitting area, a huge king-size bed, housekeeping twice a day, AC with individual climate control etc. the wooden interior décor of the room looks stunning. Houseboats: Have a comfortable stay amidst modern comforts in the well-ventilated traditional houseboats. Daily housekeeping, en suite bathroom with complimentary toiletries and a bathtub, 24-hour room service, separate sitting area, huge king-size bed, LCD with satellite connection, in-room safety deposit, tea-coffee maker, dining area, sitting area, wooden flooring, complimentary newspaper and more. Ettukettu, The Specialty Restaurant: This multi- cuisine restaurant is an 8 -sided venue that has 2 central courtyards looking like a royal structure of Kerala. Guests can relish North Indian, Chinese, Continental, Mughalai delicacies. Karimeem Pollichathu, Duck curry, Syrian Christian duck roast are some of the delicacies that are a must-try. Vembandan, the Sea Food Bar: Lying on the banks of Vembanad Lake, this is an ideal dining venue to savor authentic sea food dishes of Keralite cuisine. Thattukada, Traditional Tea Shop: If you love your cup of tea, this is the place to be. This tea shop service a vast variety of tea and coffee along with an assortment of refreshments and snacks. Pool Pavilion: At the pool pavilion, placed close to the infinity pool, enjoy food and beverages while admiring the nice view of the resort. Special meals are also arranged here.